The entire campus community is invited to participate in Webster’s yearly Teaching Festival, to be held Feb. 12-14. 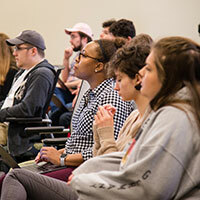 This year’s Teaching Festival will feature presentations and panel discussions by Webster faculty, students, and staff. Participants are encouraged to RSVP here for sessions they would like to attend. RSVP by clicking here! A pizza lunch will be served at noon sessions, so RSVPs are greatly appreciated. A complete program of activities can be found on the 2019 Teaching Festival page.